Bobby Jones put Atlanta Athletic Club on the major championship map, and Rees Jones got it back there. Photo courtesy of Atlanta Athletic Club. The Atlanta Athletic Club has a rather unusual history. As far as I can determine, it is the only course to host a major championship on a layout with different designers for its two nines. Bobby Jones was the club’s most prominent member, and he persuaded the USGA to bring the 1976 U.S. Open there, but Jones never saw the course, let alone played it. It’s a club that risked being outshined by the club at the site it abandoned, only to make a strong comeback of its own. Tracing this twisting tale back to its beginnings, Atlanta Athletic Club didn’t even have a golf facility at its founding. It was a downtown athletic club, but in 1908 it decided to build a golf course six miles down the streetcar line from the city center, calling it East Lake Country Club. That’s where a young Bobby Jones took up the game (his father was a member) before taking the golf world by storm in the 1920s. Following his retirement from competition in 1930, it’s where Jones played most of his golf. East Lake hosted the 1963 Ryder Cup Matches, but by then storm clouds were overhead. The pattern of growth in Atlanta left many of East Lake’s members living far from the club in the northern suburbs, while the area of the club became swallowed up by a high-crime neighborhood. That year, East Lake decided to sell 18 of its 36 holes to finance a new course and clubhouse north of the city. By 1967, the new facility had 27 holes designed by Robert Trent Jones (no relation to Bobby, but the two had collaborated on designing Peachtree Golf Club near Atlanta). 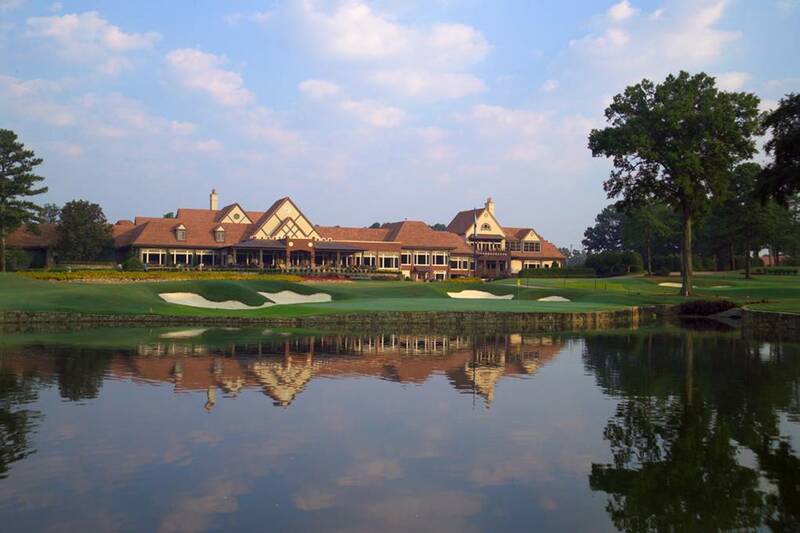 A majority of the members decided to make a complete break with East Lake, but a group of members who didn’t want to move bought the East Lake property and formed their own club. 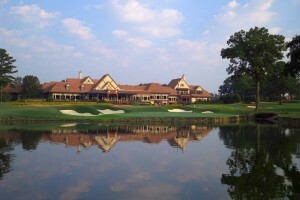 The new club, which borders the Chatahoochee River, was at first known as Riverbend Country Club. Then it adopted the rather unwieldy name of Atlanta Athletic Club Country Club. When the club closed its downtown operation in 1971, the golf facility became simply Atlanta Athletic Club. Jones, afflicted by the neurological disease syingomyelia, had not been able to play golf since 1948. He was down to 60 pounds by the time he composed his letter to the USGA, and died one month later. The USGA found it couldn’t say no to Jones, or even to his memory. As essentially a personal favor to one of the greats of the game, it brought the Open for the first time to the Southeast, where it would be difficult to get the greens at the firmness the USGA desired in the heat of the summertime. Moreover, it brought the Open to a course that it felt needed considerable work. The reasons for choosing the Highlands course over the Riverside to host the U.S. Open have been lost to history. It seems an odd choice, considering that Finger had been asked to design his nine—which was part of Highlands—for member play, whereas Jones’ 27 holes made for a stronger test. The U.S. Open layout did borrow two holes from the original Riverside course to become permanently part of the Highlands as the 17th and 18th holes. Even considering the previous five Opens had been played as Merion, Pebble Beach, Oakmont, Winged Foot, and Medinah, it was hardly a ringing endorsement. The club’s reputation dimmed. The USGA came back for the 1990 U.S. Women’s Open, which was held on the Riverside Course but proved to be rather unsatisfying for nearly all parties involved. The Highlands Course underwent a new series of modifications from Arnold Palmer and partner Ed Seay in the 1980s, but dropped off the radar as a major site. Meanwhile, East Lake underwent a revival in the early 1990s—a community revival sparked by developer Tom Cousins and a golf-course revival carried out by Rees Jones, son of Robert Trent. Suddenly, East Lake was a hot property, rising on best-courses lists and the sometimes home of the PGA Tour’s Tour Championship. Atlanta Athletic Club decided in 1995 that it needed some Rees Jones treatment of its own. Realizing that it had 36 holes that were a hodgepodge of four different designers, it hired Jones to bring about some unity. He did so by rebuilding all of the greens, bunkers, and tees. The purpose was more to improve the course for the membership than to return to the major championship scene. In fact, one of the things Jones did was to eliminate some of the bunkering in front of the greens to give the members a better chance to run the ball on. He did lengthen a number of holes, though, and the club decided to shoot for another PGA Championship, which it was awarded in 2001. The course was much better received this time around. But it didn’t prove to be the stern test that people anticipated. At 7,213 yards, even with a par of 70 thanks to two par fives converted into par fours, its length was no longer intimidating after the distance gains of the previous 20 years. Mostly, though, there was still the problem of soft greens in the August heat, which was the major factor in David Toms setting a major championship record of 265 (others have been better than 15-under, but that’s the lowest 72-hole score). So, Rees Jones was brought in again after the course was awarded the 2011 PGA Championship, this time to toughen it up. He lengthened the course some more (it will play at 7,467 yards). He reshaped greenside bunkers and moved them closer to the greens. While leaving the greens mostly alone, he added some tongues to some of the putting surfaces to provide new hole locations. Since the fairway bunkers were shallow and fairly easy to get out of, he toughened them as well as relocating them and adding new ones. Jones even reached into his bag of tricks and lowered some teeing grounds as a way of combating driving distance, equating it to the old Los Angeles Dodgers slowing up their infield. As important as any of those changes, advances in agronomy enabled a change in the grasses used on the course. Replacing bentgrass greens, a new strain of Bermuda was installed. Until recently, Bermuda surfaces could not be brought to the speed considered necessary for a major championship. But that’s not a problem with the newer strains, and their advantage over bent is that they are better suited for the climate of the South and can be maintained firmer in the summer. It’s been a rather crooked road to get there, but it seems that Atlanta Athletic Club has arrived at its intended destination.